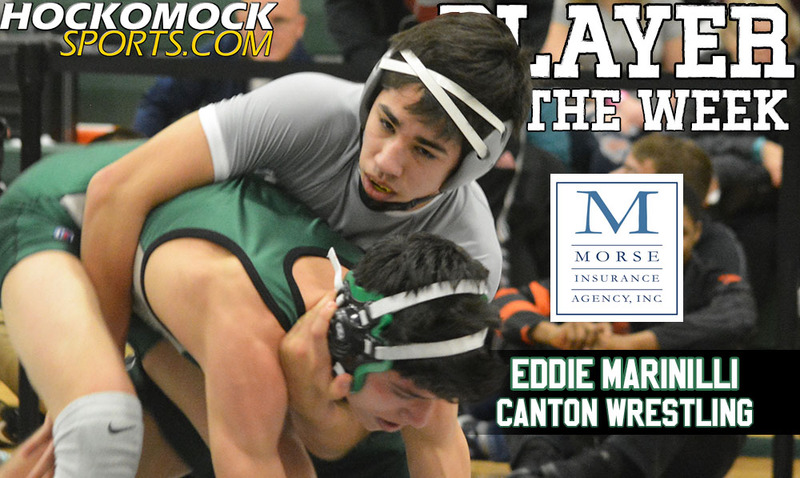 Canton sophomore Eddie Marinilli has been selected as the HockomockSports.com Player of the Week, presented by Morse Insurance, for Feb. 18 through Feb. 24. Marinilli, who is 41-3 this season, is the 21st player selected for the 2017-18 school year and 11th player chosen during the winter season. 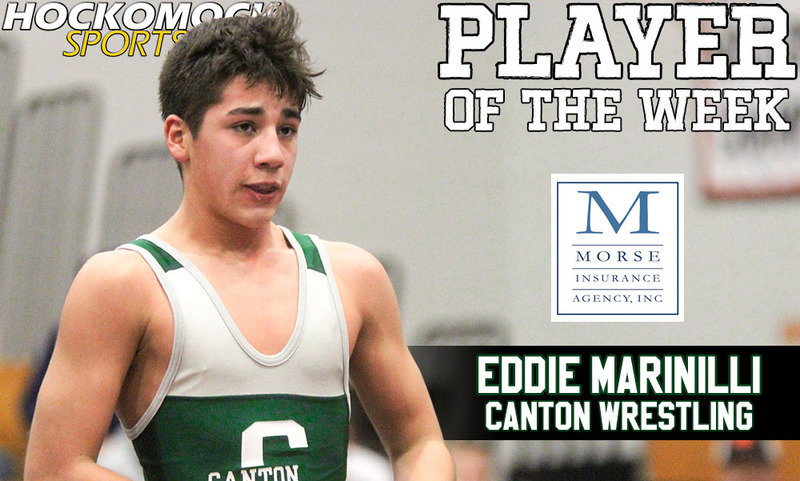 Marinilli made Canton wrestling history for the second week in a row, when he followed up his Div. 2 state championship with an All-State title this weekend at St. John’s Prep. 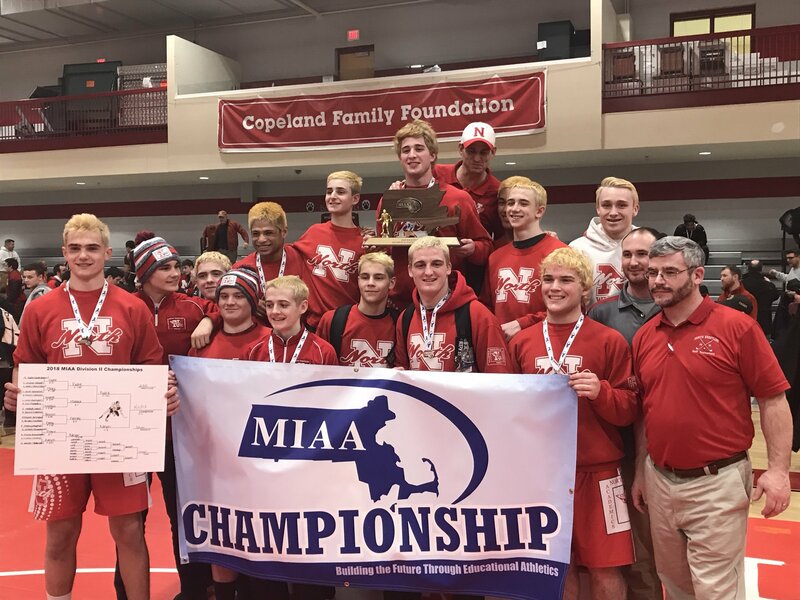 Marinilli, wrestling at 138 pounds, took the lead against the top seed, Sean Herbert of Melrose, with a second-period escape and held on for a 1-0 win in the final. He is the first wrestler in program history to win either the Div. 2 or All-State titles. “He wrestled on his terms every match and was never phased by the opponent or how high the stakes were,” said Canton head coach Brian Caffelle. “It’s impressive enough to have that demeanor as an upperclassman, but it’s even more special when it’s coming from a sophomore. To be the first All-State Champion in program history in the way that he did it won’t be forgotten for a very long time. Marinilli reached the final at All-States with a series of close wins. After starting the tournament with a pin in the round of 16, he won his quarterfinal match with a third-period escape and then used a second-period takedown to beat Mahari Miller of Springfield Central in the semifinal avenging one of his three losses on the season. He avenged another one of his losses, edging Herbert in the title match. In last week’s Div. 2 state tournament, Marinilli had a pair of pins to start, won 4-0 in the semifinal and then used a second-period takedown to win the title. In addition to his state titles, Marinilli also won the title at the Div. 2 Central meet, helping the Bulldogs finish fourth as a team. He also won his second individual title at the Hockomock Championships, getting a pin in the final and helping Canton finish fifth as a team. Marinilli won last year’s Hock title at 126 pounds before jumping up to 138 for this season. He was also selected as Player of the Week last season after his fourth place finish at All-States, which was a program-best for a freshman. Canton freshman Eddie Marinilli has been selected as the HockomockSports.com Player of the Week, presented by Morse Insurance, for February 19th through February 25th. Marinilli is the 22nd athlete selected for the 2016-2017 school year and the 10th selection during the winter season. He is the third wrestler to be selected this winter. At the MIAA All-State Meet at Reading High, Marinilli set a new mark for freshmen in the Canton wrestling program when he finished in fourth place at 126 pounds and qualified for next weekend’s New England regional meet. 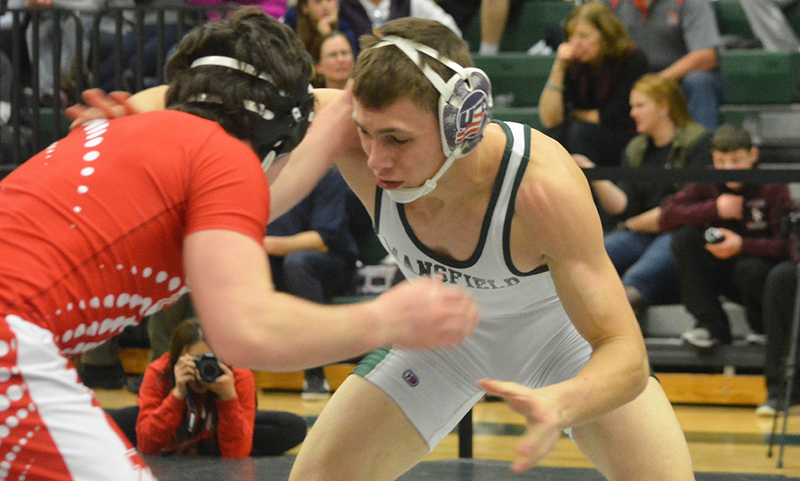 Marinilli (41-6 overall this season) opened All-State tournament with a 6-0 victory over Hopkinton’s Ryan Mastroianni, but lost to St. John’s Prep’s Malcolm Mitchell 4-2 to head into the consolation round. Marinilli won three consolation matches, including wins over Sharon’s Yosef Ellis-Rech and Foxboro’s Phil Dure and a 5-3 win over Central Catholic’s Joe Sanchez on a takedown with 19 seconds left in the third round. He faced Mitchell again in the third place match but lost 10-7 to claim fourth. “He wrestled extremely aggressive all year and that didn’t change at All-States,” said Canton head coach Brian Caffelle. “He just keeps attacking to put points on the board no matter what the situation is and it’s the biggest reason why he’s been so successful for us. He was in a tough weight class with a lot of upperclassmen but it didn’t phase him at all. This has been a solid rookie campaign for Marinilli, who took second place in D3 Central Sectional and at the D3 State Tournament. He has set the Canton freshman record for most wins, highest postseason tournament placements and an undefeated dual meet record. Marinilli also won the 126-pound weight class at the Hockomock Championships, beating Ellis-Rech 11-2 in the final.